And then there’s spying on partners, children and friends. Film and television thrillers and documentaries constantly alert us to the insidious nature of ever increasing public surveillance and a range of theatre directors have inventively appropriated spying by camera, notably Benedict Andrews in his productions of The Season at Sarsaparilla (2007), with its Reality TV invasiveness, and Measure for Measure (2010), which amplified the work’s sense of dictatorial power. But a dance work about surveillance? A fascinating prospect for a form not inclined to the literal, although the likes of Garry Stewart and Lucy Guerin have on occasion brilliantly made issues, concepts and phenomena substantially palpable in dance. Intrigued, I spoke by phone with choreographer Lisa Wilson (best known for Lake, 2012, and other works for Sydney Dance Company and the Australian Ballet) and composer Paul Charlier (a seminal Australian theatre sound designer) who were in rehearsals at the Judith Wright Centre where their new work Wireless will shortly premiere, after a long gestation. Wilson tells me the idea for the work came from Charlier in 2012. The trigger for the work, says Charlier, came from an experience in Leipzig in 1998, when he went to the recently opened Stasi Museum. “When the Stasi had been destroying their files in the last days of the government, some of the shredded files were mixed with flour and water so that they couldn’t be put back together again as had happened in Iran before that and is still going on in Berlin. It’s ‘klump,’ like papier-mâché.” Charlier was given a piece as a thank-you for coming to the museum. “And then in 2011, I was going through the app store looking for things to do with musical instruments and I noticed that there was an incredible explosion of apps that seemed to be designed for personal surveillance. Some of them were called straight out, like ‘Love Spy.’ Lots of them were disguised as baby monitors but they had pictures of adult bed-rooms indicating they could be used for other reasons. Things have moved on,” said Charlier, “from Foucault’s use of Bentham’s panopticon as a metaphor or descriptor, since that relies on knowing you’re observed, as in the case of the Stasi. Now it’s more of a ‘cryptopticon’,” to use a term coined by Siva Vaidhyanathan — hidden surveillance, such as invisible data collection from your phone. 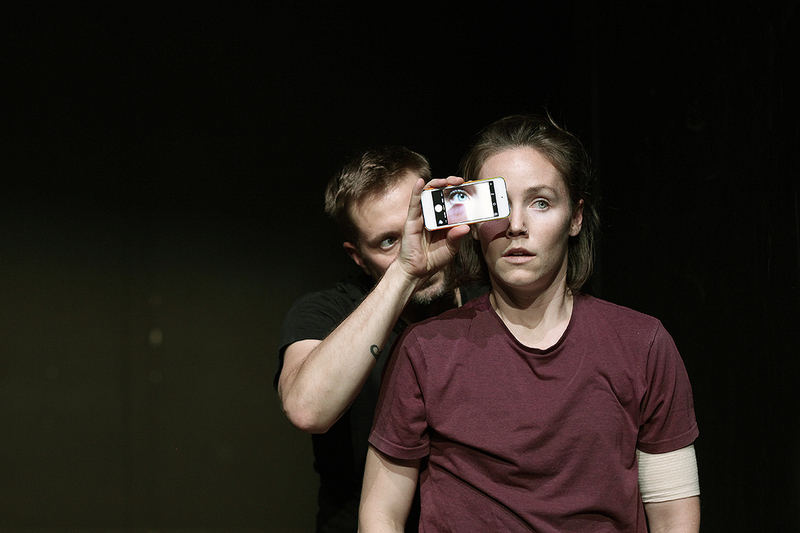 I ask how Charlier and Wilson are using phones in performance. Charlier explains, “We’re using the 25 or more sensors that don’t ask your permission when you use your phone. Your phone asks if you want to use your camera and your microphone and your GPS but in the phone is a whole collection of motion sensors that have an extraordinary range of uses. So attaching motion sensors to dancers just seems to make sense. These motion sensors are incredibly sensitive and usually when people make games on phones, the first thing they have to do is to get rid of most of the data they make because they are so sensitive. We had a phone on the first floor of the rehearsal room here and it was measuring the vibration of the building! There’s a sensor you use to measure the quality of your sleep in apps, that measure your steps when you’re running. But now they’re so sensitive that there are people who are attempting to measure your blood rate from your pocket using these sensors with the purpose of being able to work out your mood. I’m curious about Wilson’s mention of the dancers generating sounds as they perform with the score. Charlier explains, “At one extreme there’s a piece of music that’s broken up, the dancer triggering each phrase or part of a phrase. So in a way, the dancer is inserting pauses. The first time we did this it was extraordinary for me, that she danced it back, played it back in a way that I had never actually thought about and inserted pauses that hadn’t occurred to me. It’s a pretty extraordinary thing to give over control of your work to a dancer. The great thing about it is the silence and the pauses. Silence becomes them stopping, becomes part of the music. Wilson says, “I find this choreographically really interesting to get the dancers both instigating but yet responding to the sounds they’re making. So that shifts where I might insert pauses or dynamic shifts. It’s an exchange that works both ways. I ask what Charlier and Wilson think the likely effect of the work will be. Wilson thinks “it’s very relevant for where we are right now. We started this five years ago and now every day these issues are in the press— issues of privacy and the paradoxes associated with it, how much we want to give over, how much we want to keep closed. It just feels like a very current conversation.” Charlier says, “There’s a sense too in which we’re simply demonstrating what is possible with a completely everyday object, which is one of the reasons we wanted to use off-the-shelf apps. Everything we’re doing onstage, you can pretty much do if you go to the app store and download for yourself.” That in itself suggests Wireless will not only be a potently suggestive work about our relationships as mediated by phones and the rich artistic potential of the interplay of movement, music and technology, but also a worrying reminder of the darker realms of DIY.